Rena Bucley is next up on Laochra Gael. AN DUINE IS fearr ar domhan? 18-time All-Ireland champion, legendary dual star and all-round Cork icon Rena Buckley has quite the career to look back through. And she does just that alongside those close to her when she gets the Laochra Gael treatment next week. Buckley bowed out from the inter-county game last May, bringing the curtain down on a glittering dual career which she capped with camogie glory in Croke Park the previous September. 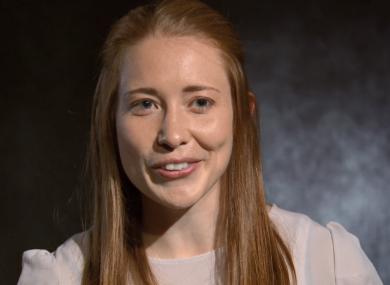 She became the most decorated player in Gaelic games as she captained the Rebels to the All-Ireland crown — and collected a remarkable 18th Celtic Cross (11 football, seven camogie) in doing so. While the 32-year-old physiotherapist likely hoped to slip away quietly and continue her club football and camogie on the down-low, the polar opposite happened with an Irish hero honoured accordingly with exceptional coverage and recognition from near and far. “I was blown away,” she recalls, adding that she was satisfied and content to step back when she did. “I was totally overwhelmed. I could not believe it. It was completely unexpected. Satisfied and content to step away when she did, Cork camogie boss Paudie Murray is one of the many contributors with kind words for Buckley on the TG4 programme. He admits that the fact that she was named captain for 2017 kept him at the helm for more, and echoes many others’ words that it’s time to name a landmark after her on Leeside. “I suppose when you drive around Cork City you’ve got the Christy Ring Bridge,” he says, “you’ve the Jack Lynch Tunnel, and certainly there would be something else named after that person whereas just Rena’s been Rena. In the episode we also meet Buckley’s boyfriend, Páidí Collins, whose father, Paddy, sings a song about ‘the greatest Rebel of them all, our darling girl called Rena’. From playing with her siblings in the back garden to All-Ireland cross coutry medals, the nerves on the night of her first All-Star (and the nine others that followed) to praying before an All-Ireland final as a team to settle themselves, the insights are plentiful. Then there was cutting a J1 short to help both county panels to All-Ireland titles, the pride in being crowned RTÉ Sport Team of the Year in 2014, and the endless stories about Eamon Ryan. And while she’ll be remembered as Rena18 by many for her incredible exploits on the pitch, her partner in crime Briege Corkery perhaps says it best at the end when she shares her memories of Buckley away from the four white lines. Rena Buckley — Greatest Human on Earth? will be shown on TG4 next Wednesday night at 9.30pm. Email “'I was blown away, totally overwhelmed. It was completely unexpected'”. Feedback on “'I was blown away, totally overwhelmed. It was completely unexpected'”.